by William A. Guenon, Jr. Many thanks for taking a peek at our humble website. As a little-known piece of Nam history, raid knowledge and its lessons lay dormant for too long; especially the nagging glitches we had to deal with that night. The mission did influence the North Vietnamese communists in positive and immediate ways none of us could have imagined back then. Hopefully you'll now be better informed, enlightened and maybe even inspired. 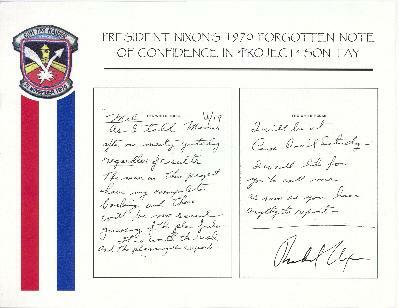 As you will discover, we always believed in the mission, had confidence in our plan, and pressed on accordingly. So, this is our story, we're sticking to it 'cause this is the way the raid went down. It goes without saying but; we would not, under any circumstance, be upset if you would refer us to everyone you know. We're self-published you understand! A thrilling eyewitness account of the secret humanitarian mission in 1970, by one of the air commando pilots who flew the amazing 'C-130' lead aircraft low level, on the edge of a stall, at night, while guiding six of our largest helicopters in close formation deep into North Vietnam for a daring rescue attempt of POWs being held in the shadows of Hanoi. It's a two-part story which also describes the raider-pilot's return to Son Tay prison 24 years after the raid, in broad daylight with only camera in hand, including his high-anxiety confrontation and arrest by North Vietnamese police. Revealed are 71 rare pictures and diagrams, most never declassified or published until now. 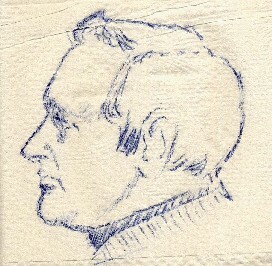 Ballpoint pen sketch of the author rendered some months after the mission on a snack-bar napkin at Ramstein AB, West Germany (then), by Tom Mosley, artist suburb and highly successful EWO of 'Cherry One,' the raid's lead C-130. William A. "Bill" Guenon, Jr., a Pennsylvania native, has spent the majority of his aviation career covering many facets of the transportation industry for both military and civil applications on a global basis. Bill served in the U. S. Air Force as a Command Pilot and Senior Air Traffic Controller. A bit of an adventurer, Bill finished third in the Great Atlantic Air Race, which started from the top of the Empire State Building in NYC and ended atop London's Post Office tower building. Although self-sponsored, his commendable time of 7 hours, 39 minutes, and 42 seconds was accomplished in 1969, using a Pan Am "Clipper" 707 well before the supersonic Concorde went into commercial service. Currently, when not involved with consulting chores for his company, WagonWings Press, Bill can usually be found mingling at air shows, aviation exhibitions, and aerospace museums. The 4 Phase Man, and coming this summer: CAIN. 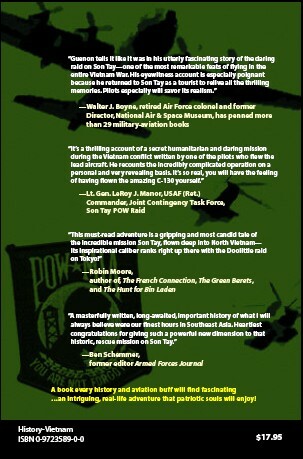 "It's a thrilling account of a secret humanitarian and daring mission during the Vietnam conflict written by one of the pilots who flew the lead aircraft. He recounts the incredibly complicated operation on a personal and very revealing basis. It's so real, you will have the feeling of having flown the amazing C-130 yourself." "Air Commando pilot Bill Guenon has written the only first-hand account of the incredible 1970 raid to free American P.O.W.s held deep in North Vietnam. Guenon, call sign, "Cherry One" flying his C-130 low, slow...20 knots below landing speed...in the dark of night operating in radio-silence, led six rescue helicopters to Son Tay -- then orbited the scene deploying flares, battle-sound simulators, and napalm bombs for ground beacons. His story is up close and personal with behind-the-scenes anecdotes that tell "the rest of this amazing story", including some surprising details. This one's a must for the keen, aviation book collector. 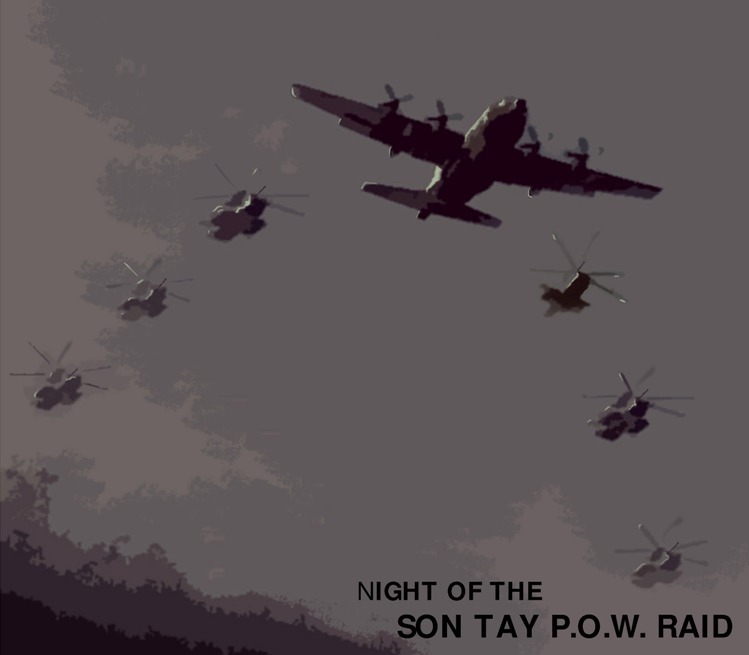 "The Son Tay POW raid was one of the most daring and adventurous events in the Vietnam War, and sitting in the cockpit of the lead aircraft made Bill Guenon eminently qualified to tell the story as it really happened. The book is well written and filled with details, some heretofore unknown. But there is more. The sensitive account of his return to Son Tay years later as a tourist provides a poignant counterpoint to the story. 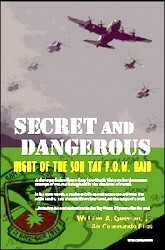 Secret and Dangerous: Night of the Son Tay POW Raid is a must read for history buffs and those interested in the Vietnam War Era." "Guenon tells it like it was in his utterly fascinating story of the daring raid on Son Tay -- one of the most remarkable flying feats in the entire Vietnam War. His eyewitness account is especially poignant because he returned to Son Tay as a tourist to relive the thrilling memories. Pilots especially will savor its realism." SECRET And DANGEROUS is a superb documentary that should be required reading for anyone who flew missions in Southeast Asia or fly today’s military aircraft. Thank you for what you did a lot of years ago. "This must-read adventure, [particularly in light of the precision CAS (Called-in Air Strikes) that defeated the Taliban and al-Qaida in Afghanistan in 2001 and '92] is a gripping and most candid tale of the incredible mission Son-Tay, flown deep into North Vietnam...its inspirational caliber ranks right up there with the Doolittle raid on Tokyo!" "You have masterfully written an important history of what I will always believe were our finest hours in Southeast Asia." "...written by an experienced special operations pilot who shares his story in the working-lingo of highly trained elite forces." "...perhaps the most detailed read on flying the daunting Son Tay Raid!" The author, air commando pilot Bill Guenon, gives lectures and talks detailing the highlights of the Son Tay mission and his return to Vietnam 24 years after the raid. If you are interested in retaining him for a talk at your event, please contact him at Bill@secretanddangerous.com . These presentations can be given in either PowerPoint or overhead vu-graph slides. The talk is flexible enough that it can be tailored to the topic or theme of your event. THE SIGNED LITHOGRAPH Available only here !! Limited Edition, Signed and Numbered, 20" x 24"
After acquiring the litho, one may seek out other P.O.W.s and raiders for their personal autograph of the print, thereby adding to its value and accelerated appreciation. This exciting creation was commissioned by an air commando pilot on “Cherry-1,” the call sign of the lead C-130. 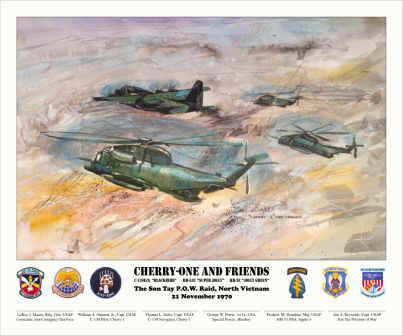 It captures the essence of flying the daunting assault-force on the edge of a stall, with three of the six helicopters in formation flying toward Son Tay prison tucked in the shadows of Hanoi. An original Giclée fine art reproduction, its signed by the raids commanding general, four raiders, a Son Tay P.O.W. and the artist, William Beyer, a noted New England painter and watercolorist of distinction. The patch images are rare and represent each of the major service units who participated in the raid..
Long awaited, this numbered, limited-edition Giclée lithograph is highly sought after by the discerning collector of fine historic military prints  a unique opportunity thats only available here! Wm. A. Guenon, Jr., Capt., USAF, C-130 Pilot, "Cherry-1"
Thomas L. Stiles, Capt, USAF, C-130 Navigator, "Cherry-1"
George W. Petrie, 1st Lt. USA, Special Forces, "Blueboy"
Frederic M. Donohue, Maj., USAF, HH-53 Pilot, "Apple-3"
Recently discovered 8.5 x 11 full-color copy of the handwritten note of raid confidence from President Nixon to Melvin Laird, Secretary of Defense, written just days before the raid. Left: Select 8 x 10 glossy: high over Florida's Duke Field runway 18, a modified picture of Cherry One, the raid C-130E(I) leading five HH-53's and one HH-3 which intentionally crash-landed inside Son Tay (closest helicopter on the left side of the C-130). Photo was taken to document the raiders' existence if they did not return. Exclusive 18 x 26 full color poster of the first-edition bookcover. 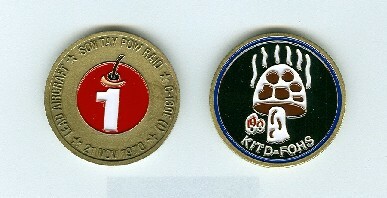 This limited edition coin commemorates the Son Tay raid and Cherry One, the lead C-130E(I) for the mission. All items are signed by the pilot. Raiders Rattle the Enemy's Cage! Through fate, the Doolittle and Son Tay Raids are inextricably linked by little-known mission similarities. These defiant low-level, revenge flights of the 20th century were signature commando operations over Asia. Each was driven by clever use of the aeronautical edge. They shared resourceful procedures involving the delicate combination of wing flaps & throttles. Execution was designed around surprise, skill, and cunning, the very essence of stealth. Most raiders were chosen for their expertise and experience. Indeed, these quiet, ruffle-proof professionals were the very soul of American patriotism especially in a wartime environment. They were young committed warriors, motivated by a confidence they could do any mission, anywhere, no matter the risk. And this they did with boundless determination, a bit of luck, and each needed some indispensable help from our resourceful Navy. Both armadas carried out their planning, training, and fine-tuning on the Eglin Air Force Base complex in Florida. They astutely saw its isolated airfields as the perfect security screen. To counter mission compromise, most raiders were not briefed on the actual objectives until just days before takeoff. They were even offered a last-minute reprieve to honorably stand-down with no repercussions. Because the missions appeared so vital to America's strategy and public morale – almost everyone declined the easy way out and volunteered to go knowing they would be facing one perilous trip, perhaps even one-way. Acting spontaneously, both groups signed their bombs with appropriate messages including the symbolic, “Kilroy was here” greeting. Although well-rehearsed and prepared, each raider force still had to cope with a startling array of glitches – always the lurking Murphy curse to ambush at the worst possible moment, especially true on clandestine operations. Or just maybe the only correct way to pull off these types of raids safely with their magnitude of threats was to plan around any conceivable threat or obstacle in order to survive. From experience it’s obvious, equally sharp minds thought and reasoned alike to respond accordingly and correctly. Independently, both groups used the same drop altitude of 1,500 feet over their respective targets. Amazingly, both raiding elements spent about 29 minutes over their immediate target areas surrounded by the myriad of threats defending their individual capitals of Tokyo and Hanoi. And both relied heavily on deception for their safety. After releasing bombs, Doolittle raiders departed to the south even though they were extremely low on fuel, and needed to be heading west in order to make it all the way to China and safe airfields. This spoof was to mislead any Japanese fighters who might decide to chase after the departing raiders. This is proof positive; one can never assume anything and should always plan for any contingencies imaginable. Critical details already covered just in case they may be needed from their deep bag of tricks. 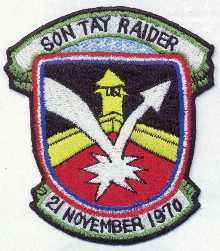 The Son Tay raiders used a big deception by having Navy fighters launch from Yankee Station carrier fleet and fly along the North Vietnamese coastline at staggered altitudes up to 30,000 feet over Haiphong and Northeast of Hanoi. This ruse was to fool the enemy defenses into thinking there was a raid or invasion coming out of the east. After the war we learned the navy diversion was so good the V were convinced there was a full invasion about to take place or already underway. So much so the high ranking leaders even fled Hanoi to China so as not to be captured. And all the while the real raiding force of MC-130s, large helicopters, and A-1Es was flying inbound, low and slow, from out of the west, the enemies’ backdoor. Incidentally, they were never detected until the very end when departing North Vietnam. This subversion had worked better than expected. Afterward both groups mistakenly assumed they had failed. Not until each war's end would their missions' full impacts be understood – surprisingly much better than anyone could have possibly imagined then. It seems the enemy's had been badly shaken - they had bought into the illusion their capitals were so well defended it would deter the US from mounting any attack. Little did they know until it was suddenly too late. Remarkably both sides of the aisle would agree: in spite of great odds, these bold raids had given the nation an unexpected boost in hope, confidence, and pride the American way.